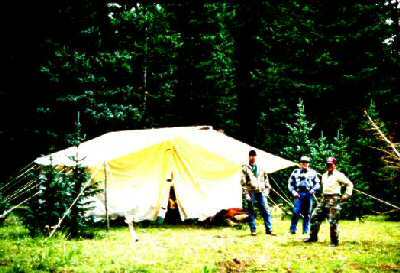 Bear Creek Adventures, hunting in New Mexico with drop camps in the Pecos Wilderness. This service provides horses and wranglers to transport you and your equipment into the Pecos Wilderness, along with the use of our comfortable tent camp during your hunt. We will provide one 12x14 wall tent for every four people, lantern & fuel, sheepherders stove (a small wood burning stove), gas cook stove, table, cooking utensils, cots, foam pads, shovel, axe, wood saw and one pack horse and one riding horse per person. We will not leave horses with you. $1,300.00 per person for a 7 day hunt plus tax. Deposit* of $500.00 and at least two hunters required to book this service. Price does not include license or landowner permit costs or any additional horses that may be needed. This service provides horses and wranglers to transport you and your equipment into the Pecos Wilderness. We will return on a predetermined date to pack you out of the wilderness. We will suggest hunting strategy as well as pack out of legally taken game FROM YOUR CAMP. We will not leave horses with you. Number of horses needed x $125.00 per day + $175.00 per day per wrangler (one wrangler can handle up to seven horses including his/her own) plus tax. Weight limit per pack horse is 150 pounds. There will be an extra charge for camps over 10 miles from the trailhead. A non-refundable deposit* of $500.00 and at least two hunters (two horses) required to book this service. Balance is due 14 days or more prior to arrival for your hunt payable by personal check, cash, Travelers Checks, or money orders. Price does not include license or landowner permit costs. * Please review our Terms and Conditions for hunters and Packing Requirements. We were both impressed with your operation. We see no reason for you to change anything. I think that we will do things a little differently next time (yes, we want to go again) in that we will probably use a second pack horse to carry a larger tent and a few more amenities. In any event we had a good time. We certainly want to try it again next year.